Gain inspiration or insight from the best! MEETHOOK CONNECTS YOU WITH THE TEACHERS, MENTORS AND PROFESSIONALS THAT CAN TEACH, INSPIRE, SUPPORT AND/OR ADVISE YOU THROUGH REAL TIME 1 ON 1 VIDEO SESSIONS. Book personalized sessions with Hosts in advance or or find a Host that is available immediately when you need it most. From lessons, advice, and consultations to backstage tours or virtual meet and greets you connect when you want, from where you want. Sign up for a free MeetHook User account to browse our current Hosts and check their availability for sessions! You can ‘favorite’ the Host profiles you like and when they become available for sessions you will receive an alert via push notification. As a MeetHook User, you are in total control over how much you spend to get access to and counsel from industry professionals that you would otherwise never have the opportunity to connect with or engage. Get ‘Hooked” with MeetHook! + Are there any costs associated with being a User? It is 100% free to create a MeetHook User profile which allows you to search through all Host profiles and favorite the Hosts you like. To truly get something special out of the MeetHook platform, book a Session with a Host of your choice, which will have a cost associated with it. Costs are determined by each Host's rate and duration of Sessions they are offering. Host's rates can change at any time, but you only pay the rate you booked a Session for. + Where do I search for Hosts? Search bar/magnifying glass: search by Host name, Skill or Keyword. Featured Hosts tab (the Featured Hosts list is updated often to include currently available, new and charitable Hosts). + What happens when I ‘Favorite’ a Host? 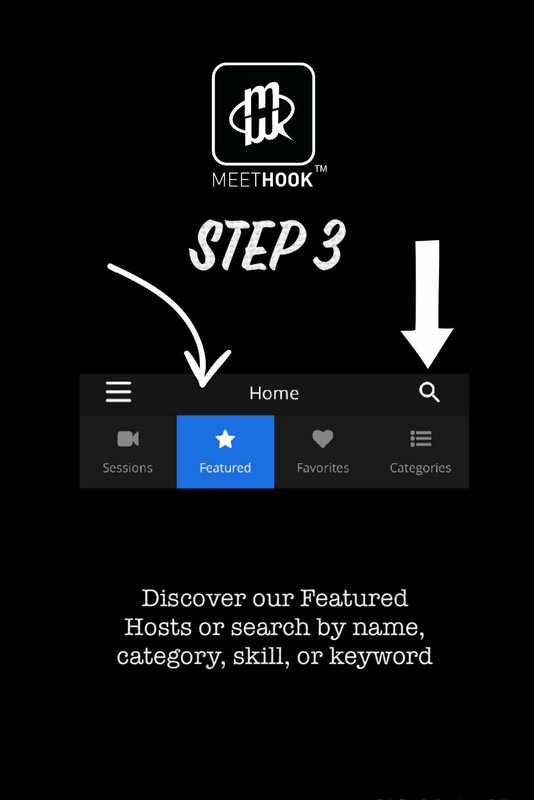 By clicking the Heart icon on a Host’s profile, it will add them to your Favorites tab and you will receive alerts via Push Notification any time the Host adds availability to their Calendar or becomes instantly available using MeetHook Now!! + What is required to book a MeetHook Session? Verified email address (MeetHook sends Users an email after the sign up process which includes a link to verify their email address. For more info please visit the section titled ‘General FAQ/How do I sign up?’ on our Support page. Card details – Credit/Debit card (i.e. Visa, MasterCard, etc.) which will be charged to pay for Sessions. + How do I book a MeetHook Session? On the ‘Available Time Slots’ Screen, select the preferred time you wish to book. Note: the available time slots you see are relative to the time zone that your device’s internal clock is set to. For more info please visit the section titled ‘General FAQ/How does MeetHook handle time zone differences when setting availability, booking or joining Sessions?’ on our Support page. Review the ‘Session Summary’ screen for accuracy and if you agree to pay and book the Session click ‘Pay Now’. 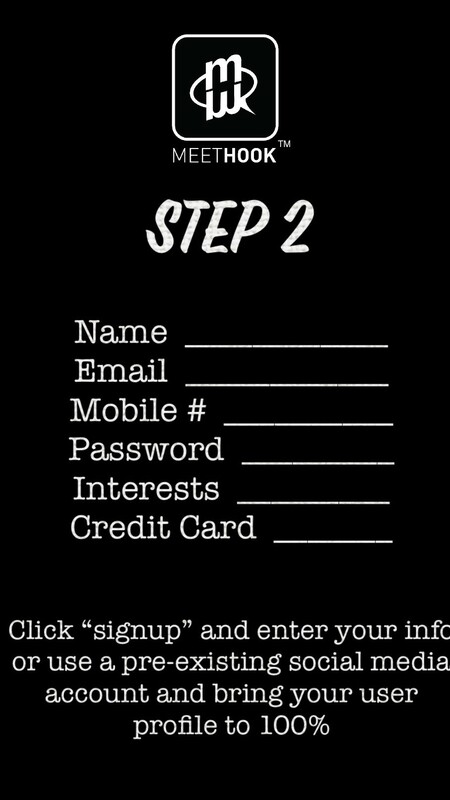 Your card will be charged and you will receive a 'Payment Success' message. Once the User’s card is charged, the funds are electronically transferred to MeetHook (through our payment processor, Stripe), and then flow to the Host’s MeetHook Wallet once the Session has been completed. You can view the upcoming Session in ‘My Calendar’ (if the Session you booked is for the current day it will also appear in the Sessions tab, and from there you will be able join the Session when it is time to start). + What happens after I book a Session? You will have the one or more of following options (if applicable). ’Start Session’ or the Camcorder icon will be available to click if the start time you booked the Session for is within the next few minutes. If the Session is not scheduled to start until a later time the ‘Start Session’ / camcorder icon will be greyed out and not available to select. ’Add to Calendar’ will be available to click if the Session start time you booked is in the future. If the Session you booked starts in the next few minutes the ‘Add to Calendar’ button will be greyed out and not available to select. 'REFER A FRIEND’ Generates an email with info about MeetHook for you to send to whomever you wish! 'SHARE' Tell your friends via email, text message/SMS, social media, etc. that you booked a MeetHook Session! + Where do I see details of my booked Sessions? My Calendar (Calendar view or List view). Click on the booked Session to view the details and/or start the Session. Dashboard/Sessions tab (only the Sessions for the current day will be listed here). Click on the booked Session to view the details and/or start the Session. + My Session was supposed to cost less than $0.50. Why was I charged $0.50? Per the acknowledged and agreed upon Terms and Conditions of our payment processor Stripe, there is a minimum credit card charge of $0.50 USD. + If I have credits in my MeetHook Wallet, how do I apply them when booking a Session with a Host? MeetHook will automatically apply available credits first when booking a Session, then the remainder of the cost (if any) will be charged to the card on the User’s profile. All information will be viewable on the payment screen as well as the History/As a User/Session Details section.